I rarely ask for cash donations. For three years Beautify CNMI has been very successful getting by with good coordination, sharing resources as in-kind contributions, and stretching every dollar we get. For example, the recent island wide cleanup was made possible with a $1500 donation for supplies by MVA and donations for prizes by Marianas Tourism Educational Council and the Kramis family of $1000 and $300 respectively. 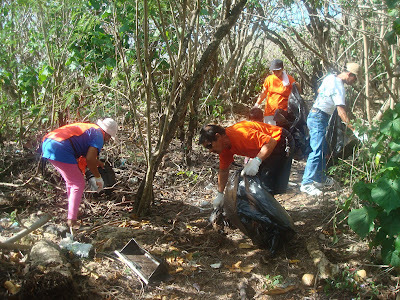 With that little amount of money and a lot of volunteer hours from the Division of Environmental Quality and other volunteers, we were able to recruit 4,140 volunteers to remove over 27,070 lbs of trash from Saipan's beaches and roads. Today, however, we are in need of about $300 to pull off our 3rd annual Boonie Dog Show. We're calling it PAWS WARS Episode III: Revenge of the Boonie. This is the annual event where PAWS and Beautify CNMI team up to educate people about the benefits of responsible pet ownership, all while having a good time laughing at the animals we love. And yes, this year we have a Star Wars theme. I am humbly asking that you donate $20 to PAWS to help us put on the Boonie Dog Show. If you can help, please contact me or Katie Busenkell at busenkell@gmail.com. 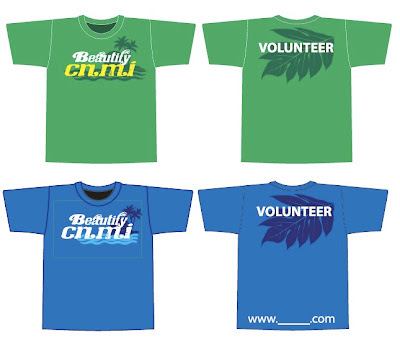 In celebration of Beautify CNMI's third year I have commissioned new Volunteer T-shirts. The designer of the shirt is none other than Dexter Mendiola, the designer of the popular Fotten Gaga t-shirts. What do you think? I had wanted to have the shirts to be ready for April's Island Wide Cleanup. Now I'm shooting for June's dog show, PAWS WARS: Episode 3 Revenge of the Boonie. 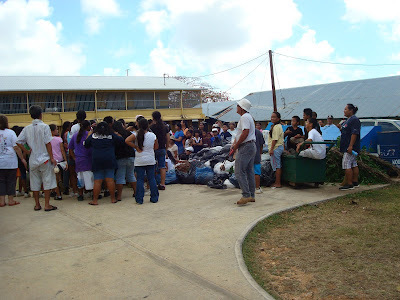 Two years ago Beautify CNMI had an adopt-a-flame tree program. Donate $25 and Beautify CNMI would plant a flame tree in your name. That year we planted flame trees along the road fronting the substation in Koblerville, in front of Koblerville Elementary School, in Dandan near the airport, along beach road, and in Marpi. I'd have to dig through my files to figure out how many we planted, but it was several hundred. I remember a local lawyer donated something like $1000 to support our project. Many of those trees are blooming this year, but unfortunately, a lot of the trees died from a combination of bushcutter damage, drought, and just bad luck. Many of the trees are doing very well, though, like I said. 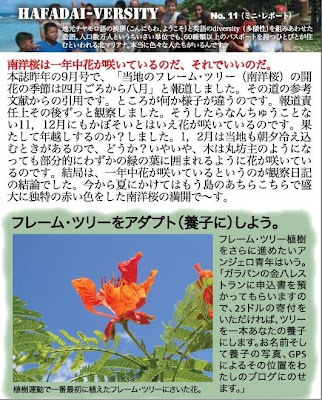 Hafa Adai Magazine included a story about our adopt-a-flame tree program (see above) in this month's issue. This evening I got a phone call to let me know that two people had adopted trees. 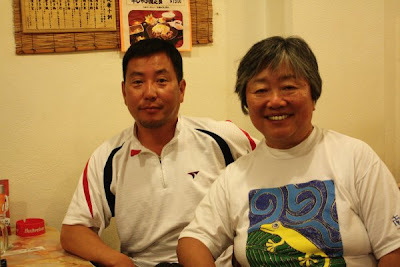 They are Mr. Nobuo Mizuno and Ms. Michiko Abe, both from Kamakura City in Kanagawa Prefecture, Japan. We are going to plant two flame trees for them. I talked to a farmer this evening about growing trees and there is a large company on island that has expressed interest in planting several hundred flame trees on Saipan (I've got a cool idea to combine planting pretty flame trees with erosion controls using native trees, but I'll write about that later), so you may see a resurgence in Beautify CNMI tree planting in the upcoming rainy season. Oceana is accepting nominees for its first Ocean Heroes Award. 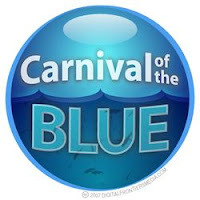 This award was created in honor of a recent action by the United Nations recognizing June 8 as World Oceans Day. Seventeen years and thousands of petition signatures after it was originally proposed, World Oceans Day will now and forever be a day to celebrate our oceans. We hope to pay tribute to the passionate, dedicated fish-huggers disguised as normal civilians and we need your assistance to expose their true identity. Please help us find our inaugural Ocean Hero. See a full description of Oceana's Ocean Hero Award here. Saipan, (CNMI) – Two elementary schools and a government agency that provides early intervention services for infants and toddlers are one hundred dollars richer today as Beautify CNMI! 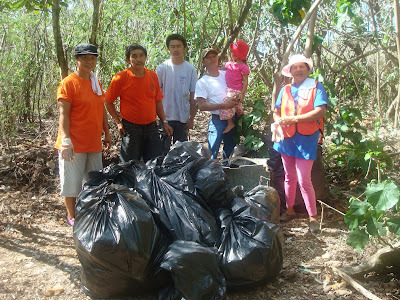 handed out prizes to groups participating in last month’s island-wide cleanup. Garapan Elementary School received $100 for the photo they submitted of their entire student body right before cleaning up their campus and the surrounding neighborhood. They won the contest for the photo with the most volunteers. “I told some of the staff that we won and they were really proud,” remarked Dale Roberts, Vice Principal of Garapan Elementary. 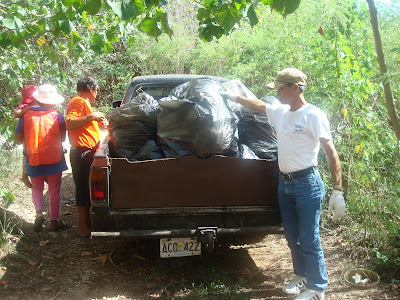 In the contest to take a photo of the biggest pile of collected garbage, San Vicente was declared the victors. ACT President Betty Miller was on hand to accept the $100 on behalf of the students. “We had a lot of support from the parents on our cleanup day and they deserve a lot of the credit,” said Miller about winning the contest category. Each of this year’s 61 participating groups also had their names put into a random drawing to win $100. William S. Reyes 5th grader Shizuka Takayama pulled the name of the Children’s Developmental Assistance Center during a press event at the Marianas Visitors Authority office on Wednesday. Award winners: Roberts and Miller with the $100 checks for their schools. Saipanda is also pictured. 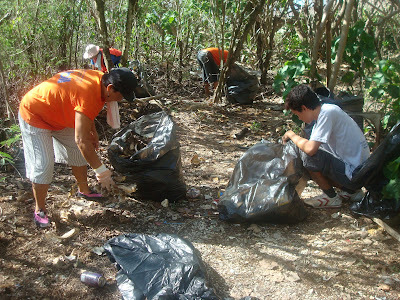 The 2009 island-wide cleanup had the participation of 4,140 volunteers from 61 groups and over 13.5 tons of litter was removed from the streets and beaches of Saipan. 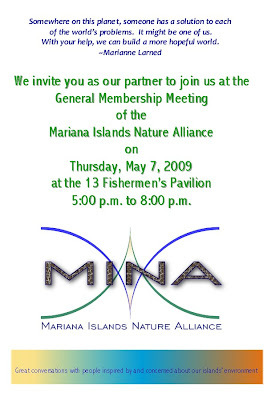 The Rotary Club of Saipan, Division of Environmental Quality, Marianas Visitors Authority, and Marianas Tourism Education Council coordinated the event. I've had a Beautify CNMI t-shirt shop online for about two years and the only thing I've ever sold is a button. Maybe two. 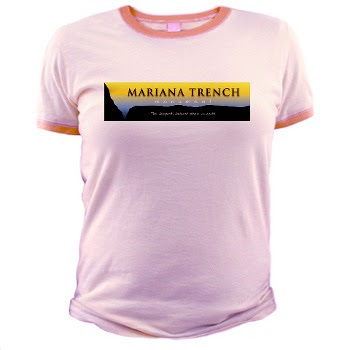 I get requests for Marianas Trench t-shirts on a pretty regular basis, so I figured I'd at least make the option to buy a t-shirt online available for those die-hard conservation fans that have to literally wear their support on their sleeve. 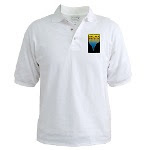 Cafepress is great because you simply upload a graphic and attach it to any number of merchandise items. The basic service is free, which for my purposes is all I need. Harry Blalock uses Cafepress for his Axe Murderer Tours merchandise. It is really a great service. You don't have to worry about fronting money for merchandise or ordering the right amount of XXXL shirts, you let them worry about all that. You simply upload the images and design your shirts. Then sit back and they do all the work for you. I don't expect too many people to buy one of these shirts, but at least now they have the option. 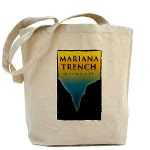 Click HERE to visit the Marianas Trench online t-shirt shop.